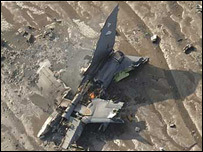 A salvage operation has started to recover the wreckage of a Tornado jet which crashed into The Wash.
Two airmen ejected safely as the Tornado from RAF Marham in Norfolk crashed close to Holbeach bombing range in Lincolnshire on Tuesday. One theory is that the RAF jet could have struck a bird or a flock. Squadron Leader Mike Jukes, a former Tornado pilot, said it was virtually impossible to avoid birds in flight. He told BBC News he had flown into birds on several occasions. He said a pilot would instinctively try to manoeuvre the aircraft and then wait for the impact before analysing the situation. "A flock of birds would be impossible," he said. "I have been in that situation. The only reaction you can do is get your head down because one of the big problems is them coming through the windscreen as well as taking the engines out." RAF Marham's Air Commodore Greg Bagwell said a full inquiry was under way. "We will go through the full process to establish the reasons and causes of the crash and we will act upon that." He added: "I've spoken to the crew and they're fine." The crew were picked up from the sea by helicopters from the Wattisham Airfield in Suffolk and RAF Leconfield, near Beverley, East Yorkshire. Holbeach Range is north of Holbeach and is used as a bombing range by Tornado, Harrier and Jaguar aircraft. The Tornado GR4, which costs about £30m, is considered as the RAF's primary attack aircraft, flying at low level and supersonic speeds. RAF Marham operates four squadrons of Tornado GR4s and each aircraft carries a pilot and a navigator.